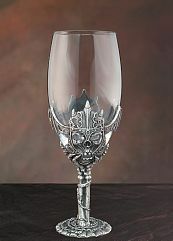 Skull Wine Glass-Rare Only 1 Pair Left-Sorry Sold! 7.5 inches, made of pewter. The perfect wedding gift for your favorite gothic bride and groom. This item has been discontinued and we only have 1 pair left. These will only be sold as a pair. These have been sold and are headed to a good home.